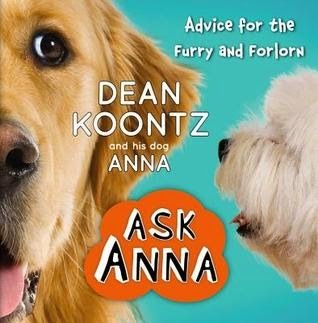 Ask Anna by Dean Koontz With her superior intellect, sharp wit, a warm and fuzzy heart, Anna Koontz debuts her talent as an advice columnist in her seminal work ASK ANNA: ADVICE FOR THE FURRY AND FORLORN. All author proceeds go to Canine Companions for Independence. Dean Koontz is one of the world's biggest selling authors. Anna Koontz is Dean's remarkable dog who is poised to follow in her dad's footsteps with her first advice book for canines. She will soon become canine columnist to the world! With her superior intellect, sharp wit, a warm and fuzzy heart, Anna Koontz debuts her talent as an advice columnist in her seminal work ASK ANNA: ADVICE FOR THE FURRY AND FORLORN. Some of her best advice: take time daily for ball-chasing and belly rubs - the keys (along with sausages) to true canine joy. Great book for dog owners, dog lovers or folks who love to read and smile. Anna is Dean Koontz dog and like her daddy she is a writer. She writes advice to other pouches who write in to her. Dear Anna, what is it about tennis balls? Huh? What is it? Why do we like to chase them until we exhaust ourselves? It is an enjoyable book that can be read all at once or just whenever you have a second. Love it. Nothing to commit too during these next few busy weeks.